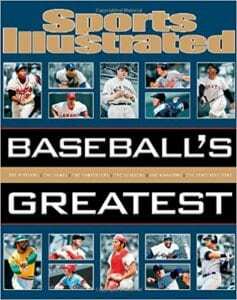 Sports Illustrated has published some excellent coffee-table type books on various sports, with lists of the greatest, the best and the top ten, for both kids and adults. One of their newest offerings is a book on the best baseball has to offer, whether it be players, managers, or ballparks. This book is more than a coffee-table decoration – it should be read, enjoyed, and argued over! In essence, it’s a fun book to get us all thinking of opening day. The book is divided into twenty chapters, the majority of which deal with players – a chapter on the best first basemen, another on the best second baseman, and so on, down the line of all the positions. Then it’s on to the best managers, games, franchises, etc., until the very last chapter that looks at the ‘best of the rest’ (uniforms, movies, quotes, and even best Sports Illustrated covers). Each of the ‘best of the rest’ list takes up a mere page, but for the major categories, there’s a full page devoted to each person, park, whatever the list is about, plus typically two pages devoted to the top position. Each page includes a photo of the honoree, what clubs they played for (and the years they were there), a comment from one of the Sports Illustrated panelists who selected the winners, brief career highlights, and a quote pulled from a Sports Illustrated article about that player, manager, park, game, etc. If you’re looking for a book heavy with statistics, this is not that book. Rather, this is a big (288 pages), heavy (about 5 pounds) hardback, replete with fantastic action shots of our favorite players and ballparks. I agreed with many of the selections but then, found myself at times saying, ‘Nah, not that game,’ or ‘Really? That player?’ But truly, isn’t that the fun with these Best Of books? It’s impossible to come up with lists that everybody will agree with but it’s a great idea to put together a Top Ten and get us all talking. If you love baseball, check out this book! Quill says: Thankfully, baseball season is just around the corner. Get ready for opening day with a great book on the best of the best and see you in April!